These landing lights can be used for scales from 1/15 to 1/3 depending on the vehicle. The outside diameter of the lens is 20mm. One Light will plug directly into our 1070 series Landing Gear Controller. Two landing lights can be connected to one controller using the Landing Light Adapter Cable. When used together with our LGCII and without the driver, the lights will operate at somewhat reduced power. Lights without the lens are also available. These lights are not suitable for direct connection to a battery. You will need this cable to directly connect two landing lights to one of our 1070 series Landing Gear Controllers. 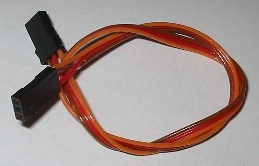 The cable uses universal servo connectors and can be easily extended using servo extention cables. You will need this power switch if you use our High-power Landing Lights together with our LGCI, to get the maximum brightness when used with our LGCII or if you are using our lights with another system. Two of our lights can also be connected directly to our LGCII using the splitter cable. This switch can also, by special order, be used with other power LEDs. You will need this cable to connect our Landing Light Power Switch to our 1041 Landing Gear Controllers. 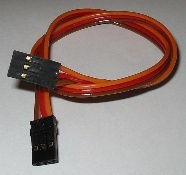 The cable uses universal servo connectors and can be easily extended using servo extention cables. You will need this cable to connect our Landing Light Power Switch to our 1070 Landing Gear Controllers. 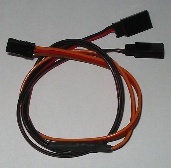 The cable uses universal servo connectors and can be easily extended using servo extention cables.